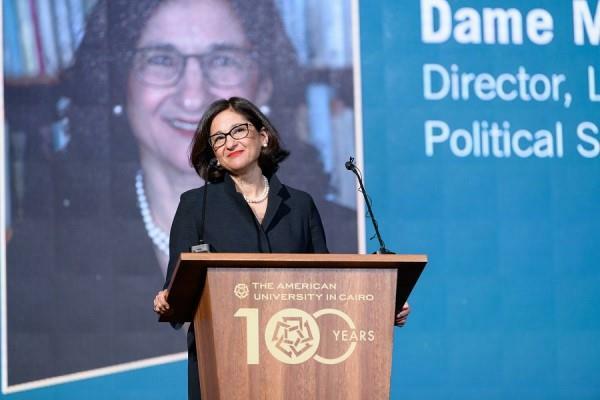 (MENAFN - Daily News Egypt) Nemat Shafik, also known as Minouche Shafik, is an Egyptian economist who currently occupies the position of the Director of the London School of Economics and Political Science (LSE) and the first woman in the school's history to hold this position. She was the guest speaker in the annual Nadia Younes memorial at the American University in Cairo's Greek Campus last week. Shafik delivered a lecture where she spoke about several aspects of her career and shared her experiences during her work as deputy governor of the Bank of England, as well as her work in the World Bank and the International Monetary Fund (IMF). Shafik discussed the situation of the Egyptian economy and the way changes have been affecting citizens. She also said that introducing programmes to provide needier families with cash in Egypt, like Takaful and Karama, have been hugely important for making sure that nearly between 1.5-2 million families – the poorest in Egypt – have a minimum income that enables them to spend money on things like education and more nutritious food. 'But while the gap between rich and poor in Egypt has actually shrunk. The middle class has done relatively worse.' In the last decade, the percentage of downwardly mobile Egyptians has actually exceeded the number of upwardly mobile Egyptians, she added. Shafik noted, therefore, luck has become more important than effort in driving a person's success, which may be a main factor contributing to the observed decline in life satisfaction of citizens in many polls in Egypt. Shafik concluded the lecture by answering a few questions by the attendees who included several public figures, university professors, and students.